Have you watched this video before? It’s called ‘Beautifully Imperfect’ and if you haven’t watched it, please do so now. It’s funny and so wise. Do you find it easy to accept your own imperfections and those of others? Such a touching video! Thank you for sharing! It had me tearing up. In today’s society, we are so focused and obsessed about being perfect in every way, that we forget that imperfections are what make someone really beautiful. It’s part of what defines us as individuals. It doesn’t mean we shouldn’t try to improve them, to be better, but we should also accept them and learn from them. This was so beautiful. I had to share it on Facebook. Thank you for the reminder! A very beautiful video ! It is true that it is the small things that matter. We must look within.Your quotes are also motivating. The quotation of St. Augustine is superb.Only a man can find out his/her imperfections.How true!!! 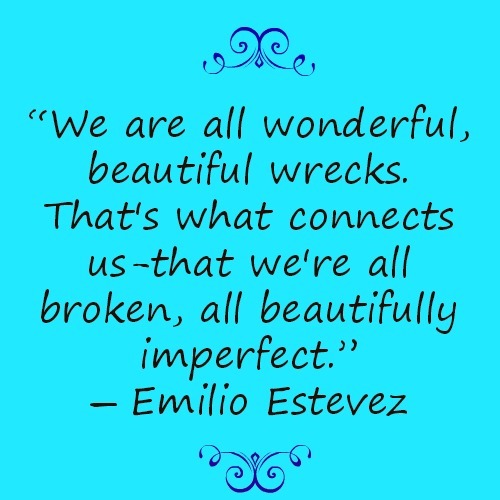 Who would have ever thought that Emilio Estevez would say something so profound! The jock from Breakfast Club! Much better at it now than when I was younger, Corinne. Oh, how God does grow us in His time! I now see my imperfections as He sees them – loving me no matter what. Great post and wonderful quotes! Oh my gosh! I don’t think I’ve ever seen a more beautiful video. Thank you for posting this! What a lucky man. What a lucky woman.